How often do you journal and what do you do with it? In the past few weeks I have journaled extensively and reflected on the past year, It was an aha moment when I realized Mark Virkler had the greatest impact on me in 2008 of all the new people I met or connected with. Yet we only spoke for one hour on June 9, 2008. How could that be? It’s because Mark taught me four simple keys to hear God’s voice and followed up with an email which I reflected upon. The next morning (June 10), the Holy Spirit woke me up around 4 am. 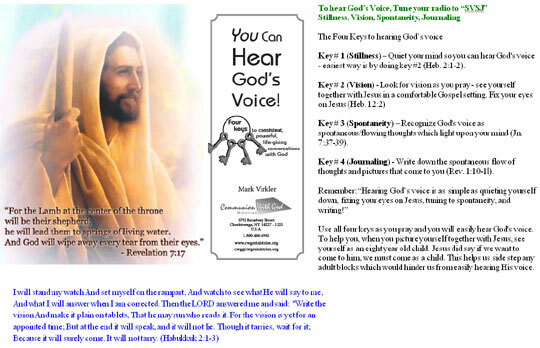 He immediately prompted me to go to my desk to design a new computer desktop image (“You Can Hear God’s Voice”) with an image of Jesus, a list of the 4 keys, and Habukkuk 2:1-3. (See today’s Blessings of the Day). After doing that, I began 2-way journaling for the very first time in my life. After doing this, I emailed the desktop image to Mark along with my journal entry for that morning. He responded promptly with a very encouraging email, counseling me on how to make my prayer even more personal. On June 17 Jerry Graham and I officially launched our 35 day course titled “UNCOMMON Journaling For Destiny.” Each day during the 35 days, students and coaches were given one question to ask Jesus and then apply two-way journaling. Everyone who took our course and completed the assignments experienced substantial breakthroughs. Since then, it’s been a journey of deeper and deeper intimacy with Jesus and richer relationships with people. 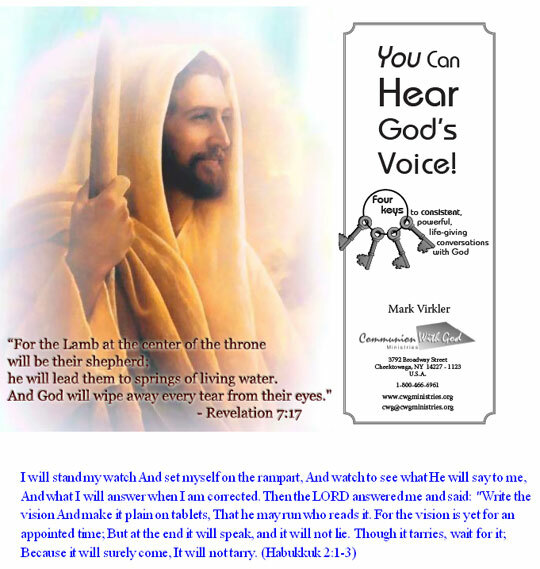 By visiting today’s Blessings of the Day, you can read Mark Virkler’s simple message he emailed to me on June 9 teaching the 4 keys to hear God’s voice, Enjoy and be transformed. Jesus, thank You for using Mark Virkler as Your vessel to teach me the 4 keys to consistent, powerful, life-giving conversations with You. Thank You for our daily dialogs. Guide my followers to learn to hear Your voice consistently too. Thank You Jesus. I love You. You’re my all-in-all. Amen. Blessings to learn to journal 2-way to hear and obey the voice of the LORD! The age in which we live is so married to rationalism and cognitive, analytical thought that we almost mock when we hear of one actually claiming to be able to hear the voice of God. However, we do not scoff, for several reasons. First, men and women throughout the Bible heard God’s voice. Also, there are some highly effective and reputable men and women of God alive today who demonstrate that they hear God’s voice. Finally, there is a deep hunger within us all to commune with God, and hear Him speak within our hearts. As a born-again, Bible-believing Christian, I struggled unsuccessfully for years to hear God’s voice. I prayed, fasted, studied my Bible and listened for a voice within, all to no avail. There was no inner voice that I could hear! Then God set me aside for a year to study, read, and experiment in the area of learning to hear His voice. During that time, the Lord taught me four keys that opened the door to two-way prayer. I have discovered that not only do they work for me, but they have worked for many thousands of believers who have been taught to use them, bringing tremendous intimacy to their Christian experience and transforming their very way of living. 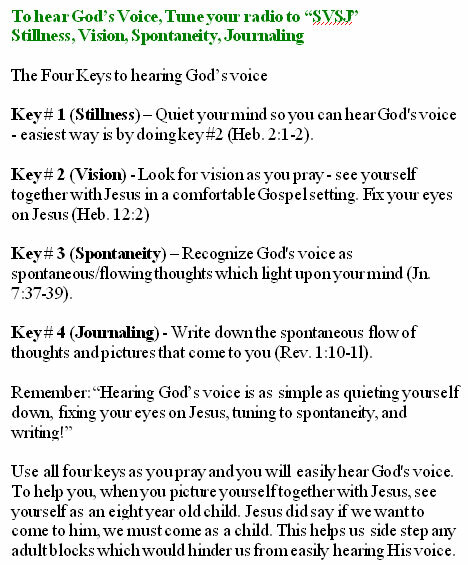 This will happen to you also as you seek God, utilizing the following four keys. They are all found in Habakkuk 2:1,2. I encourage you to read this passage before going on. Key #1 (STILLNESS) – I must learn to still my own thoughts and emotions, so that I can sense God’s flow of thoughts and emotions within me. I have found several simple ways to quiet myself so that I can more readily pick up God’s spontaneous flow. Loving God through a quiet worship song is a most effective means for me (note II Kings 3:15). It is as I become still (thoughts, will, and emotions) and am poised before God that the divine flow is realized. Therefore, after I worship quietly and then become still, I open myself for that spontaneous flow. 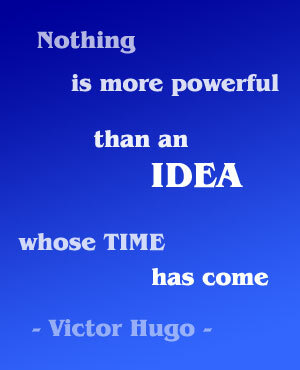 If thoughts come to me of things I have forgotten to do, I write them down and then dismiss them. If thoughts of guilt or unworthiness come to my mind, I repent thoroughly, receive the washing of the blood of the Lamb, and put on His robe of righteousness, seeing myself spotless before the presence of God (Is. 61:10; Col. 1:22). As I fix my gaze upon Jesus (Heb. 12:2), becoming quiet in His presence, and sharing with Him what is on my heart, I find that two-way dialogue begins to flow. Spontaneous thoughts flow from the throne of God to me, and I find that I am actually conversing with the King of Kings. It is very important that you become still and properly focused if you are going to receive the pure word of God. If you are not still, you will simply be receiving your own thoughts. If you are not properly focused on Jesus, you will receive an impure flow, because the intuitive flow comes out of that upon which you have fixed your eyes. Therefore, if you fix your eyes upon Jesus, the intuitive flow comes from Jesus. If you fix your gaze upon some desire of your heart, the intuitive flow comes out of that desire of your heart. To have a pure flow you must first of all become still, and secondly, you must carefully fix your eyes upon Jesus. Again I will say, quietly worshiping the King, and then receiving out of the stillness that follows quite easily accomplish this. Key #2 (VISION) – as I pray, I fix the eyes of my heart upon Jesus, seeing in the Spirit the dreams and visions of Almighty God. I had never thought of opening the eyes of my heart and looking for vision. However, the more I thought of it, the more I realized this was exactly what God intends for me to do. He gave me eyes in my heart. They are to be used to see in the spirit world the vision and movement of Almighty God. I believe there is an active spirit world functioning all around me. This world is full of angels, demons, the Holy Spirit, the omnipresent God, and His omnipresent Son, Jesus. There is no reason for me not to see it, other than my rational culture, which tells me not to believe it is even there and provides no instruction on how to become open to seeing this spirit world. The most obvious prerequisite to seeing is that we need to look. Daniel was seeing a vision in his mind and he said, “I was looking…I kept looking…I kept looking” (Dan. 7:2,9,13). Now as I pray, I look for Jesus present with me, and I watch Him as He speaks to me, doing and saying the things that are on His heart. Many Christians will find that if they will only look, they will see. Jesus is Emmanuel, God with us (Matt. 1:23). It is as simple as that. You will see a spontaneous inner vision in a manner similar to receiving spontaneous inner thoughts. You can see Christ present with you in a comfortable setting, because Christ is present with you in a comfortable setting. Actually, you will probably discover that inner vision comes so easily you will have a tendency to reject it, thinking that it is just you. (Doubt is satan’s most effective weapon against the Church.) However, if you will persist in recording these visions, your doubt will soon be overcome by faith as you recognize that the content of them could only be birthed in Almighty God. Is it actually possible for us to live out of the divine initiative as Jesus did? A major purpose of Jesus’ death and resurrection was that the veil be torn from top to bottom, giving us access into the immediate presence of God, and we are commanded to draw near (Lk. 23:45; Heb. l0: 19-22). Therefore, even though what I am describing seems a bit unusual to a rational twentieth-century culture, it is demonstrated and described as being a central biblical teaching and experience. It is time to restore to the Church all that belongs to the Church. Key #3 (SPONTANEITY) – God’s voice in our hearts sounds like a flow of spontaneous thoughts. Therefore, when I tune to God, I tune to spontaneity. The Bible says that the Lord answered me and said…(Hab. 2:2). Habakkuk knew the sound of God’s voice. Elijah described it as a still, small voice (I Kings 19:12). I had always listened for an inner audible voice, and surely God can and does speak that way at times. However, I have found that for most of us, most of the time, God’s inner voice comes to us as spontaneous thoughts, visions, feelings, or impressions. For example, haven’t each of us had the experience of driving down the road and having a thought come to us to pray for a certain person? We generally acknowledge this to be the voice of God calling us to pray for that individual. My question to you is, “What did God’s voice sound like as you drove in your car? Was it an inner, audible voice, or was it a spontaneous thought that lit upon your mind?” Most of you would say that God’s voice came to you as a spontaneous thought. Key #4 (JOURNALING) – Journaling, the writing out of our prayers and God’s answers, provides a great new freedom in hearing God’s voice. God told Habakkuk to record the vision and inscribe it on tablets…(Hab. 2:2). It had never crossed my mind to write out my prayers and God’s answers as Habakkuk did at God’s command. If you begin to search Scripture for this idea, you will find hundreds of chapters demonstrating it (Psalms, many of the prophets, Revelation). Why then hadn’t I ever thought of it? I called the process “journaling,” and I began experimenting with it. I discovered it to be a fabulous facilitator to clearly discerning God’s inner, spontaneous flow, because as I journaled I was able to write in faith for long periods of time, simply believing it was God. I did not have to test it as I was receiving it (which jams one’s receiver), because I knew that when the flow was over I could go back and test and examine it carefully, making sure that it lined up with Scripture. You will be amazed when you attempt journaling. Doubt may hinder you at first, but throw it off, reminding yourself that it is a biblical concept, and that God is present, speaking to His children. Don’t take yourself too seriously. When you do, you become tense and get in the way of the Holy Spirit’s movement. It is when we cease our labors and enter His rest that God is free to flow (Heb. 4:10). Therefore, put a smile on your face, sit back comfortably, get out your pen and paper, and turn your attention toward God in praise and worship, seeking His face. As you write out your question to God and become still, fixing your gaze on Jesus, Who is present with you, you will suddenly have a very good thought in response to your question. Don’t doubt it, simply write it down. Later, as you read your journaling, you, too, will be blessed to discover that you are indeed dialoguing with God. Some final notes: No one should attempt this without having first read through at least the New Testament (preferably, the entire Bible), nor should one attempt this unless he is submitted to solid, spiritual leadership. All major directional moves that come through journaling should be submitted before being acted upon.